May 2, 2014: Stefanie Zweig (1932-2014) died Apr. 25 (NYT obit). Her two books Nowhere in Africa (1995, $17 at amazon) and Somewhere in Germany (1996, $24 on amazon) would make a great pair for a sequential 133B-C.
Jan. 11, 2014: Posting my W'2014 133c syllabus; and coming soon the Source Exploration Handout. Reader at ?Alternative Copy in the UCen. Joel Agee, Twelve Years: An American Boyhood in East Germany (Univ. of Chicago Press, 2000). Bernhard Schlink, The Reader (Vintage, 1998). 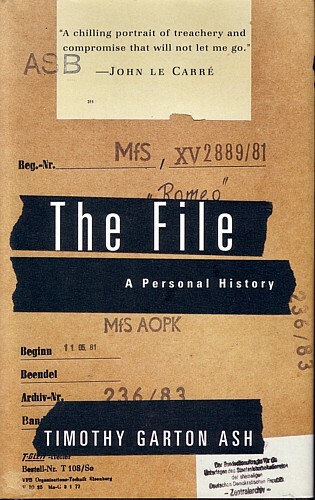 Timothy Garton Ash: The File: A Personal History (Random House, 1997). March 6, 2012: Der Spiegel just published in its English edition a 5-part series about former Nazi officials who went on to have careers at the top level of government in West Germany from the 1950s to the 1970s. Take-off point: an 85 page answer to a parliamentary inquiry from Dec. 2011 that lists such officials. Historians are now looking into more detailed records at several ministries, as well as police and intelligence services. Interesting about how denazification is being reassessed as time marches on; nice photo series. The Chronicle of Higher Education also has an interesting article about how the German Historical Institute in Warsaw (since 1993) & other German institutions "help" eastern European countries investigate their histories under Nazism & Communism. New Anne Frank exhibition in Frankfurt gets 6000 items discovered in Switzerland, Spiegel interviews Anne's cousin Buddy Elias (4 years older), with 20 photos. I sent links to these articles on my Twitter feed @German_History (tweets 90 & 91). 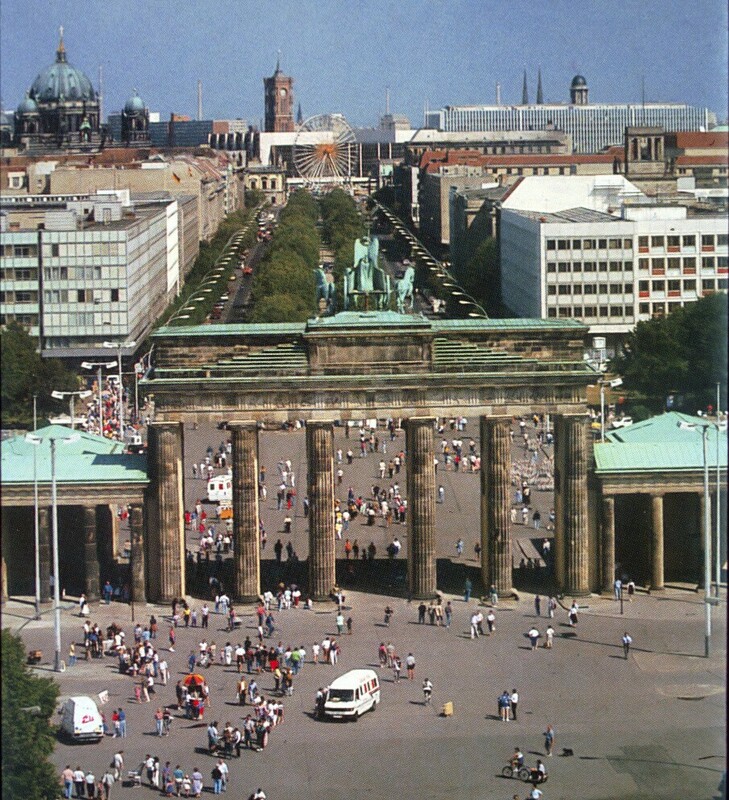 July 11, 2011: A reader has sent me this page of excellent links about the Berlin Wall. 1998 Web exhibition by the House of the History of the Federal Republic, "Divided Together: 50 Years of Political Cartoons about Unification from East and West." Has one cartoon from each year for each state, with explanatory captions. Mar. 27, 2011: The Spring 2011 course is full with a waiting list of 23. (meets in Phelps 1119, TR 3:30). The required books for this course are listed below. This course no longer fulfills the writing requirement (no paper required), since as class size increased, I could no longer manage the workload. Since 2009, my course websites have been on Gauchospace (password protected), since that course management software (moodle) includes online assignment submissions, news forum and such like, which make course adminstration more efficient. dynamic age pyramid of German population, 1950-2060 (click Play and watch the years at the top as the structure changes). 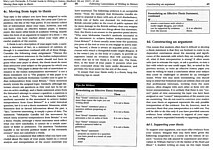 Jan. 2, 2011: Course resources page rescued from orphanhood. A charismatic older non-politician who resisted the East German regime (Joachim Gauck) was almost elected president over a super-slick career politician (Christian Wulff). The former was a clear favorite among the people, but not among the political delegates who choose the president. Citizens from all walks of life are protesting the demolition of the old Stuttgart train station, while the gov't maintains that 15 years ago they acceded to its replacement, even though there was little information and few channels of input. on impact of the 1978 TV miniseries Holocaust: "Martin Broszat, die westdeutsche Geschichtswissenschaft und die Fernsehserie 'Holocaust'" in ZF 3(2009). on films about the Nazi camps, "Memory of the Camps," PBS Frontline, May 2005. You can watch the film online as well. May 15, 2010: last November, on the 40th anniversary of the fall of the Berlin Wall, the Wendemuseum in LA brought together pieces of the wall and shut of Wilshire Blvd. At about 7 mins. the "famous quote" footage of Kennedy and Reagan at the wall is shown. Several contemporary muralists painted segments of a contemporary wall as well. In May the news broke that the West German policeman who shot Benno Ohnesorg in Berlin on June 2, 1967 had been a spy for the East German Stasi for over a decade. See this May 27, 2009 New York Times article, "Spy Fired Shot that Changed West Germany" (note: reader comments are also interesting), and in Die Zeit, "Benno Ohnesorgs Todesschütze war IM". Spike TV also has a 1:10 video clip with the original news footage at the shooting. Bernd Eichinger's 2008 film The Baader-Meinhof Complex is now in general release (Wikipedia BMC film page). BTW, it graphically reenacts the Ohnesorg killing (murder). Then send me a confirmation e-mail that you have checked your essay. If things need to be fixed, please list them in that e-mail. For typos, give me the few words before and including the error, so that I can find them quickly. Have a good break. I will try to post the grade distribution soon. Reader: some texts may be on Gauchospace or this website. 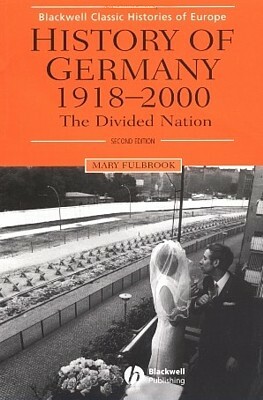 Textbook: Mary Fulbrook, History of Germany, 1918-2008: The Divided Nation (2008). [$32 at amazon] DD240.F85 1992 [full text on-line through UCSB library]. The 1992 edition with a reversed title is fine to use, and the 2002 edition ("1918-2000) is fully equivalent. . Excellent textbook starting in 1918 but focusing on the post-1945 period. Ika Hügel-Marshall, Invisible Woman: Growing up Black in Germany (Continuum, 2002; Peter Lang, 2008), 155 pages. Any edition is ok. 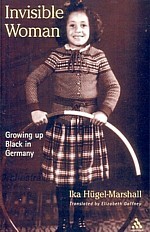 Autobiography by the child of a German woman from a small Bavarian village and a Black US GI who left Germany before she was born. A historian/journalist who worked in East Germany and Poland in the 1980s returns after the fall of the wall to read the file the Stasi kept about him. Any edition of this book is also ok. The German Historical Museum (DHM) in Berlin has lots of mages and documents in its collection. East German propaganda documents, at an excellent site created in 1999 by Randall Bytwerk at Calvin College in Grand Rapids, Michigan, author of Bending Spines: The Propagandas of Nazi Germany and the German Democratic Republic (2004; $17 at amazon). Germany-Info.org, maintained by the German Embassy in Washington, D.C., has fact sheets, a timeline, a historical overview (3 parts about 1945-present on right), and some historical features, such as on unification. Not to miss: the newsletter archive, cultural archive, archives of speeches since 1996-- it's endless! The US Embassy in Germany has a "History of German-American Relations" site with great documents from 1683 to the present, easily navigable with great e-texts (some are in my Hist 133c course reader) and links. Nicely illustrated short lecture series by Adolph Hoffman, a German instructor at Santa Rosa Jr. College, on "Berlin and the Two Germanies, 1945-1989." The US State Department has documents from the Foreign Relations of the United States (FRUS) about Germany and Berlin online (1964-1968 link). Grading can serve many purposes. Among them are: motivating students to engage with the material (by providing feedback and rewarding effort), assessing how well students have done the assigned work, and ranking students relative to each other. My bottom line: I want the grades I give to be a FAIR reflection of the effort (attendance, doing assignments, meeting deadlines) and learning (content of submitted work) you show, and to give a rough indication of where you stand on those factors relative to others in the class. The mean (average) grade was 86.0, and the median was 87. Interested in grade inflation since the 1970s, all across the USA? Check out this website: www.gradeinflation.com. On the second-to-last graph, the one with the scattered points, you'll find UCSB below the blue line at the 10-year time span. The researcher got data from UCSB's Office of Budget and Planning showing that our campus GPA went from 2.84 in 1994 to 2.93 in 1999. First, please note that I grade YOUR WORK, not you. Write a page (or paragraph, whatever it takes) explaining WHY you think your work is better than the grade assigned to it. Please refer to the appropriate assignment sheet (for book essays and web projects), and make sure you did the assignment. Then resubmit the work in question with your explanation, and I will regrade it and get back to you. Be sure to put some contact address on your explanation sheet, so that I can be in touch with you. I keep all student work for at least one quarter after the course is over. If you would like to pick up your work, please come to my office. During my office hours is usually best for me, but if you would like your work left in an envelope in the envelope outside my door, or to arrange a different pick-up time, send me an e-mail or leave a note. Sept. 29, 2004: I found an interesting teaching site developed since 1999 by a German teacher teaching at an elite school in Korea, "WHKMLA," hosted by the Center for Instructional Media in Germany. It is in English, and especially the links seem to be unique (they go beyond the usual). Nov. 11, 2004: Was Ronald Reagan the "real" cause of the fall of the Berlin Wall? In an op-ed piece in the LA Times "It was Reagan who tore down that wall," conservative historian Dinesh D'Souza argues he was. My and other letters to the editor argue he wasn't. So: What evidence does D'Souza present to make his case? What did cause the fall of the wall? July 27, 2005: Deutsche Welle's Dummy's Guide to German Elections is quite good. July 19, 2005: Nicely illustrated blog entry by Norman Birnbaum summarizing the summer 2005 political situation in Germany. Gives concise background information. Feb. 27, 2006: The reading for Wed., Mar. 1, is available as scanned images; more easily printable OCR text will be available soon. Apr. 25, 2007, 6pm: Q4 due Friday: From Fulbrook chap. 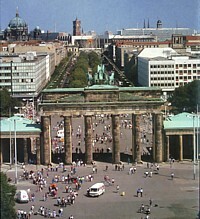 7, name the *5* events *1949-1960* that you think are most important in cementing the division of Germany. Apr. 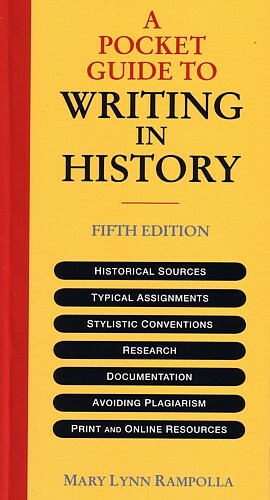 28, 2007: Q5 due Monday: Based on the introduction, recommended (chap. 3=1938-40, chap. 4=1940-42) , and required (chap. 8=1945, chap. 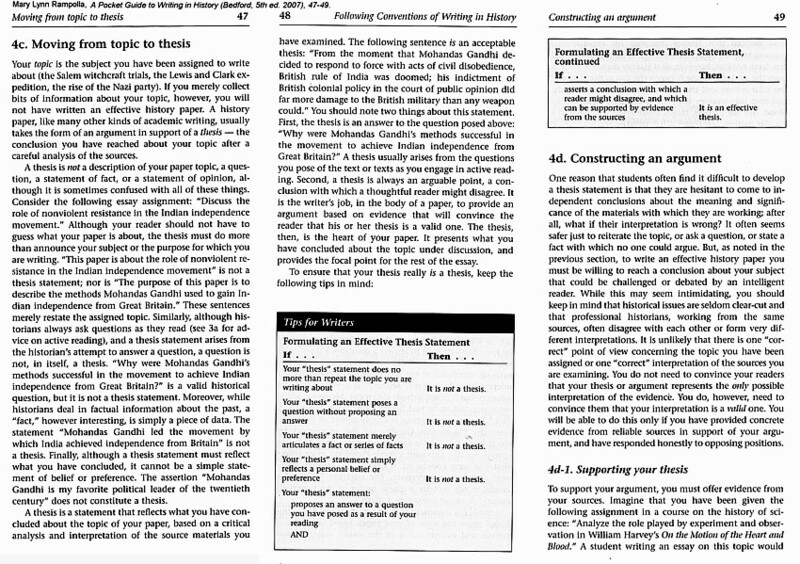 9=1945-46) reading, write 3-4 questions to ask Prof. Mahlendorf. Best is if you clip a short quotation from the text on which your question is based, and include it with each question. Be sure to complete reading at least chaps. 8 and 9! Prof. Mahlendorf will be our guest on Monday. Don't forget that the required film The Promise will be this Monday evening, Apr. 30. May 4, 2007: Q6 due Monday: Based on the 1944/47 Horkheimer & Adorno text on eres (password: road), give 5 short quotations indicating each of the EIEIO causes of antisemitism. Dr. Judaken will be our guest speaker on Monday, so please be prepared with questions about that text. May 21, 2007: Q8 may be due on Wed., May 23. It will be based on Dirk Philipsen's 1990 interviews with Frank Eigenfeld and Harald Wagner (available as pdf on eres, password road; and as text and images on this site). The pdf is the best for printing. for each dissident, name the 3 most important motivations why they became dissidents, with brief explanation why it was important for them (6 bullet points). You should also start reading The File over the weekend. It is a relatively fast-paced read, but may be hard to fit in during next week. We will discuss it next Friday. June 1, 2007: Q9 is due today (Friday) . In preparation for a discussion of The File, name 6 Stasi IMs/employees, stating who each was and why they spied. June 14, 2007: I've finished uploading the web essays with links from the essay index page. Note whether your name and the book author appear in the title bar of your browser (the bar across the top of that window). Proofread your essay for spelling or formatting errors. If you find any, please note the first 3 words of the paragraph in which the error occurs when you notify me. Notify me of what you find--even if there are no errors. That e-mail to me will be the all-clear signal that you get the appropriate credit for the assignment. For those of you taking the final, good luck, and I hope to see you in my office when you drop it off on Thursday. There is no time limit, but it is designed to be done in 3 hours. For everyone: Have a good summer! Reader: some texts will be on eres or this website. Nov. 4, 2007: student essay upload page now available for testing; excellent master page of reviews of the DHM German history exhibition at zeitgeschichte-online. Sept. 2, 2008 : There are about a dozen people on the waitlist for Fall 2008, with no open spaces (enrollment is closed). I will give out codes once classes start. The class will meet TR 2-3:15 in BSIF 1217 (Biological Sciences Instructional Facility). The map at right shows the location (click the map for a larger view). 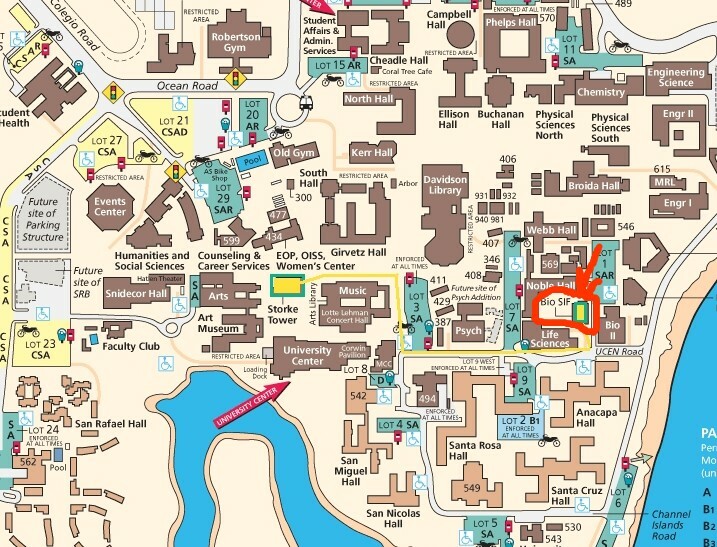 The classroom is on the ground floor, in the middle of the side that faces towards Goleta Beach (towards Bio II on the map). GHI's German History in Documents and Images project: 1945-1961, 1961-1989, 1989-pres. Youtube video of National Anthem, with slideshow of famous cultural sites in Germany (4:28). There's also one for the East German anthem (2:53). Sept. 18, 2008: Waitlist. There are two spaces available in the class, 3 students on a priority waitlist, and another 14 on a regular waitlist. Priority is given to: EAP students, students who have previously taken a class with me (knowing my "ropes" already increases the amount they can learn), students who were previously enrolled and were dropped (with documentation only), then seniors with hardships or such like. I checked the classroom: there aren't enough desks to let in more than 48 students. Purchasing course books early: scroll down to the July 11 announcement to see the 3 books required for this course. I saw 28 copies of each of the books in the UCen bookstore, and IV bookstore usually has a few copies. Thus they are expecting about 15-20 students to obtain the books elsewhere, and you can probably save some money by buying them from online seller (see links to amazon pages below--the used prices may change as people buy the cheap ones). Finally, note that all editions of all three books are perfectly suitable! Even the textbook, whose first edition has a different title, only has minor changes. So check the "other editions" link on amazon for cheaper prices, if you're interested. If I remember correctly, the UCen bookstore is selling the books for: textbook $43 [$32 used], $25 Invisible Woman (new only), $15 The File (new only). You add sales tax for the UCen, or $4 shipping to amazon used orders, or new under $25. Sept. 23, 2008: Waitlist. Now 4 spaces available. Spiegel sample test of 33 questions in English--a bit slow to navigate. DDW: 10 questions in English, or 33 auf Deutsch--mit Erklärungen. Compare this pdf of 100 questions & correct answers for the US naturalization test. This article lists 100 of the 310 questions, but without the multiple choice answers. In 2006 the state Baden-Wurttemberg implemented its own anti-Muslim test: bbc article. Sept. 29, 2008: Introductory survey: All students--please take this short survey! It is intended to help the professor get to know the class profile--how familiar you are as a group with German history and culture, what foreknowledge and preconceptions you have. A few questions are for future planning of how I design this and other courses. It is completely anonymous. Waitlist. Only one, possibly 2 spaces available. If you are above no. 8 on the waiting list, there is no chance. I'm sorry. Oct 1, 2008: Question 1. I'm still trying to figure out how to get GauchoSpace to allow you to submit your Q1 online. In any case, here it is. Note that in class I said 4 factors; actually there are 5. Name *five* main factors that explain patterns of stability and change in 20th century German history. For each, give one example. Your answer should be about 200-300 words long (1 page); bullet points are fine. Chapter 1 is listed when you expand "Acknowledgements;" chap. 14 is Part III. Note 2: if you have trouble submitting your answer on GauchoSpace, bring a typed or neatly handwritten copy to class on Thursday. PS. Please don't forget to take the anonymous survey--link under 9/29--18 people have taken it as of 11pm Tuesday. PPS. If you can't get the e-textbook and haven't obtained your own copy yet, you can "trick" amazon.com into letting you read the pages you want. Load the amazon book reader, then: Choosing "excerpt" will give you pp. 1-6, but what you really need is pp. 7-14. Searching the word "patterns" will let you select p. 7 and read up to p. 9. Search "zero" will allow you to choose 10 and continue to 11. Oct. 8, 2008: Q2 due Thursday & course survey. I've now posted Q2 as an assignment on the GauchoSpace course website. Use your UCSBnet ID and password to log in. Only online submissions are possible; please notify me if you have any problems: marcuse@history.ucsb.edu. Also, so far only 33 of you have taken the course survey. If you haven't done so already, please take a few minutes to answer the simple questions. Finally, on Thursday I will have the book essay assignment handout. Oct. 9, 2008: Books for Essay page is ready to go; more books will be added over the weekend. In the West German woman's movement, which was stronger: gender or "racial" solidarity? Give examples from Ika's life comparing sexism vs. racism. Select two quotations and explain how they illustrate this. Note: you should bring your notes or a hard copy to class to help you participate in the discussion. Also: I'd like everyone to add their picture (portrait) to their Gauchospace profile. That will help me to learn/remember your names or at least recognize you. Thanks! (password: generation) as the first 2 pages of "Division Documents, 1953-1963." Then discuss in the usual 200-300 words, *in order of importance*, what Eisenhower thinks are (and are not) the main causes of the East German uprisings. Do you think he is correct, or would you weight some factors differently? This event is also discussed in textbook chapter 7, section "Ulbricht's Germany". Nov. 3, 2008: Q5 due Tuesday; read Ch. 12 by Thursday. Q5 is now on the Gauchospace course website; it is due before class on Tuesday. Comparing the *school systems* in East and West, by the 1980s which one had more democratic access (across all income levels), and which had more democratic teaching (student input) in the classrooms? In the *world of work,* were women's employment opportunities more equal to men's in East or West? Give two indicators that tell us this. In *family relations,* do marriage and divorce rates indicate that marriages in the East were generally stronger (more emotional commitment between partners), or weaker (more commitment out of economic necessity) than in the West? Nov. 7, 2008: Q6 due *Monday*, 11/10, 2pm, on GauchoSpace. Based on chapters 11 and 12 of the textbook, name 6 bases (groups, issues) of dissent, 3 in East, 3 in West Germany, from the 1960s to the 1980s. For each, give a 1-sentence assessment of its significance. That page also has a link to more info at the bottom. Also, I will hold extra office hours on Monday, 11/10, noon-2pm, especially for questions about the book essay, due Thursday. Nov. 18, 2008: The web option due date will be next Tuesday, Nov. 25, in class. You are welcome to submit earlier, under my office door or in the History office. Q7 will be due this Thursday, 11/20. It will be based on this reading: Philipsen, We were the people, pages 35-55, as well as the textbook, chapter 13. For Eigenfeld and for Wagner: What were the 3 main motivations for each of them to become dissidents? Make six bullet points, each of which should include a brief explanation. Nov. 23, 2008: The Review Guidelines handout and Web Option handout will be available online later today (11/24: 3 page pdf). Whether you choose the web option or not, you have something due on Tuesday: Either your revised & corrected essay, OR the web option supplements, both in hard copy. On Monday, 11/24 I will have extra office hours from noon-2pm. If I made a note about your thesis, it maybe helpful to re-read the thesis handout--see the Nov. 11 announcement. 1. You need to have read the book The File by Tuesday in class. There may be an in-class Q8 about it, and we will discuss it in any case. What was the career path of the person who became the last head-of-state of East Germany in Alex's fictional world? (Hint: He is featured in the last fake news broadcast.) Discuss the symbolism of his first job, for the film as a whole and in Alex's view of "the truth" in particular. Name three things that moved Stasi Captain Gerd Wiesler to change his mind and try to protect playwright Georg. Discuss why or why not you think Wiesler gets what he deserves in the end. Finally, I have been asked about watching both films for extra credit. I guess that is ok, but I really don't want to give extra points to people who have already seen the films, since extra credit is for extra work, not prior knowledge. So, on the honor system, if you haven't already seen both films and want to answer the question for the other one as well, you can get up to two extra credit points. These would also be due uploaded by Sunday at 10am, with the words in caps at the top: FOR EXTRA CREDIT. I'll ask in class how many would like to see which film. Type in or cut-and-paste the requested data into the form fields (your name, book title, etc). The last form box, for the text of your essay, does not work for any special characters, which include curly "quotes" (not like these). It will also lose your bold and italic formatting, unless you insert it as html code. If this means nothing to you, forget it, do not upload the essay text. Now go back to Gauchospace, find the assignment due this week, and upload the .doc or .rtf file of your ENTIRE corrected essay WITH all of the web supplements, ESPECIALLY the bibliography, in one file. Go to the assingment for uploading an image, and if you have an image (in general, it would be the book cover you found on amazon or somewhere), upload it. If not, don't sweat it. Submit in class the hard copy of your web option SUPPLEMENTS ONLY. I don't want the hard copy of your essay itself. I will check the file you uploaded. You have an extension to get all of this done until Friday at 5pm. And I have my fingers crossed that it will work. This counter counts each computer only once each day, no matter how many hits come from it. 2004 analysis: 33 students enrolled. Thus each student checked this site about every 3rd day early in the course, about every 2nd day mid-way through, and almost every day at the end. 63 hits/wk, or each student checked twice each week. Note: entry - exit = number of viewers coming into this page, but looking at other pages before leaving the site.